It’s true that canal barge cruises carrying 4-20 passengers can be more expensive than ocean cruises and some river cruises, but there are ways to save money without sacrificing one tiny bit of quality. Most barges will honor the current year’s prices for the next year if bookings are confirmed with deposit early. For example, if you want to go barging in 2018, book your cruise in early spring of 2017. Remember that September is the most popular month for barging, so book even earlier if that is your preferred time. If you can make plans 2-3 months prior to travel, we often have special offers with 10-20% discount for cabin or charter bookings. It’s all subject to availability at the discretion of the barge owner. Special offers apply only to new bookings and are not retroactive for bookings already confirmed. For example, take a look at spring special offers the winter before travel. Charter barges for your own private group. Hotel barges where you can book cabins with other passengers on board. All hotel barges are available for private charter, but not all charter barges accept cabin bookings. Typically, chartering the entire barge results in a lower price per person. For example, the 6-passenger Emma on the Canal du Midi can be chartered for $30,000 ($5000 per person), but booking an individual cabin is $5500 per person double occupancy. Many barges offer value and regular season prices with value season being April, sometimes May, mid-July to mid-August and the last two weeks of October. For example, check out the 2017 rates for 12-passenger Luciole which has a lengthy value season at $4550 per person for cabin bookings rather than $4950 for regular season. It has single cabins, too, with no single supplement making this a great opportunity for solo travelers. For those who enjoy a variety of dining experiences, consider a half-board charter cruise for your group of 4-6. Independently owned and operated, the barge owners can offer a flexible meal plan which reduces the price. For example, the 6-passenger Magnolia in Southern Burgundy is very affordable at $18,400 half board for 6 ($3067 per person) rather than $23,650 full board for 6 ($3942 per person). The half board plan includes all meals except 4 meals on shore at guests’ expense. Excursions, open bar and everything else in a full board cruise are still included. Want help navigating the barges to find the best cruise for your interests and budget? Contact us whenever you’re ready. We’re always ready to help. When is the Best Time to Go on a Barge Cruise? When is the Best Time to Book a Barge Cruise? What is an All-Inclusive Barge Cruise? Thank you to our guest writer, Ginny Blackwell, as she tell us about her first barge cruise. I don’t think it will be her last! Ginny is the owner of International Property Shares, and provides opportunities for people to own fractional shares in charming homes in France and Italy. With Captain Julian at the helm, his able and friendly crew take care of guests’ every need. As I stepped aboard the Athos barge a week ago, I looked forward to visiting the Minervois region of southern France again, but in the slower, more luxurious way that a canal barge offers, one lazy bend of the canal after another. My family always thinks of this corner of the world as “home” since our family spent a year here in 2003 so our children could really master speaking French. You may know that life in the Languedoc very much follows the seasons. As April sunshine warms the vines and new green buds appear, the hotel barges which have been dry docked since fall, begin preparing for the summer season. All the wood work is sanded and varnished, the interiors freshly painted, and the hull gets cleaned, sorted and readied for the barging season. With helpful travel tips from Beth Hanson, owner of CanalBargeCruises.com, I tried not to over pack but to come prepared for any kind of weather: 2-3 pairs of pants, neutral colored tops with a variety of scarves to dress things up, a dress up outfit for the captain’s dinner, and a good raincoat in case of grey skies. One good thing to remember is that the Mediterranean wind is fairly constant in southern France. What a beautiful barge! The Athos is 30 metres long with 5 en-suite cabins and open dining area/salon with large windows offering plenty of light. It also has as a full kitchen, living quarters for the crew and, of course, the deck where we lounged about a good deal of time. As we entered to drop off our bags, I could appreciate all the special touches: fresh flowers greeted us in each cabin as well as specialty chocolates and toiletries, the walls were bright and freshly painted for the season, champagne was chilling on the bar with candles lit for our first meal together. “Hmm- this is going to be fun!” I thought. FOOD: Hang onto your hats here because I have NEVER had more inspired and 5-star meals, one after another. If our first day’s menu doesn’t leave you pining for more, then nothing will! Sunday, April 3rd: Scallops with sweet potato and pea puree followed by pork belly with braised red cabbage and star anise puree, a choice of two cheeses (Valencay and Cantal) followed by the most delicious lemon and almond tart ever. Each of our meals was paired with wines from the Languedoc region and either Mariana or Joueja, our two hostesses, explained their features and why they were chosen. For the first evening, a Chateau La Voulte Gasparet was paired with the scallop entree followed by a Chateau Ollieux Romanis, Cuvee Classique 2012. CREW: One of the barges moored right next to the Athos smiled over at us and said, “You have one of the best crews on the Canal du Midi.” I couldn’t agree with him more! Our two hostesses, Mariana and Joueja, our tour guide Mathieu, top notch cook Emma and Captain Julian, worked seamlessly together as only people can with a shared vision and purpose. It was easy to see that they genuinely enjoyed each other as well as their work. KNOWLEDGE: I am not typically one of those people who enjoys guided tours, preferring to discover things on my own . . or to fall asleep on deck with a book in hand. That said, spending ½ day each day with our light-hearted and knowledgeable tour guide, Mathieu, was one of the Athos barge highlights. Each evening he would show up after cocktails and before dinner to let us know the program for the following day. Some of the must-see visits included Carcassonne and Minerve where we heard a graphic depiction of medieval life during the Cathar era. But we also learned about how to distinguish between Roman and Gothic architectural features, how one flood changed the course of the Aude river as well as the course of history for Capestang, a former port city. On a lighter note, we saw the secret mixing chambers of Nouilly Prat vermouth and learned some tactical moves to win a game of petanque (boules). FELLOW TRAVELERS: I think my favorite memories in life are those where you’ve just plain had fun with those around you . . and laughed and joked a lot. This was certainly the case with our group of 5 passengers: Dan and Victoria from Sydney, Australia and Sophie and Dan from Denver, Colorado and me. We swapped travel stories and photos, played a wine board game after dinner, knocked down quite a few afternoon beers as well as enjoying the quiet and relaxing beauty of life along the canal. THE ATHOS JOURNEY: from Argelliers to Marseillan (including the six locks of Beziers). If you are looking for a unique way to be pampered from the minute you arrive and yet still have plenty of time to quietly soak up a week of slow relaxing travel, don’t hesitate to book a French barge canal trip on the engineering marvel of the Canal du Midi, even as early as April. There’s something to be said for having the canal to yourself. Written by Ginny Blackwell, owner of International Property Shares, which provides opportunities for people to own fractional shares in charming homes in France and Italy. Does this whet your appetite for a barge cruise aboard Athos. Whenever you’re ready to consider a barge cruise, we would be happy to help. “The whole trip on the barge Luciole was wonderful, and we were blessed with beautiful weather. We were met in Paris – how convenient! Anna met us with the van at the Hotel Mansart at the appointed hour and we left for Clamecy, stopping on the way to pick up a family of 3 in Auxerre. There were 11 passengers total, a wonderful mix of people, all well-traveled and all Americans, except for the couple and their older daughter from Australia. Too bad I didn’t get to practice my not-very-good French, but we did that in Paris. As it turns out, the owner, John Liley, was on board for a few days – he said he liked to captain the boat, and also give Francisco, the captain, a break. It was great to meet him and learn a little about the history of the Luciole and barging in France in general. Captain Francisco is friendly and engaging, Anna is a charming and knowledgeable tour guide, George and Susie, our hosts, are fun loving and always there to help, Mark is an amazing chef and Tom, the matelot (deck hand) is very cute and friendly. I miss them all. Mark prepared wonderful meals – everything was delicious and beautifully presented. I’m slowly withdrawing from enjoying all the wines and cheeses we had. It was an added bonus to learn a little bit about all the food and wine we were served. The set-up is nice – buffet breakfast and lunch, with passengers seated at 3 individual tables, and dinner all together at one long table. Susie always did something intricate folding the napkins :). The Captain’s dinner, with Francisco and Anna, on our last night was wonderful. We enjoyed walking along the path and meeting some of the lock tenders. (I got to steer the barge! It’s hard work!) The flowers were still beautiful, though the sunflower fields (there are so many!) were about done. The days flowed smoothly, with time to enjoy visiting/reading/just relaxing on the sun deck, walking the paths by the side of the barge, the leisurely meals and the interesting tours at all our afternoon/overnight stops. “The passengers all exchanged email addresses at the end of the trip, and one of them has already shared some pictures. Gail and I ended this memorable vacation with 4 days in Paris. We both agree this was a nice way to finish the trip and “come down” from our Luciole experience. Beth’s note: Thank you, Nancy, for taking the time to share your experience on board Luciole. We wish you and Gail many more happy travels with lovely people and special memories. Would you like to go barging on Luciole? Whenever you’re ready, I’m here to make the process easy and enjoyable from booking to boarding. A Canal Barge Cruise or a River Cruise? What is the Difference? Perhaps you’ve seen the ads on television, with the large, stately vessels floating along a scenic European river, and you think to yourself, “that sounds like a lovely, relaxed way to see Europe.” And you would be right! Enjoy browsing our website with 40+ canal barge cruises to choose from. Walking and biking are possible only when the ship is moored. Some ships provide bicycles. Prices start at $3,000 per person and vary by stateroom category and season. Guided excursions including entrance fees are included. There may be optional excursions available with a supplement, i.e, hot air ballooning, golf, etc. All meals and wines are included (some half board plans are available on small charter barges). Barge cruises and some river cruises offer an open bar. Dietary restrictions are gladly accommodated. Ready to go barging or river cruising? Contact us today to experience the unparalleled beauty and experience of a vacation on the water, with all the individual attention of a personalized, and personal-sized, canal barge cruise or elegant river cruise. And so it is my pleasure to highlight the chef, cuisine and wines of this very special barge cruise on Esperance. One of Captain Mathias’ many talents is the table setting for each dining experience. His sense of style and joie de vivre are impeccable. Chef Joe is not only a fabulous chef, his personality is warm and welcoming. Cooking demonstrations? You bet! The open kitchen on Esperance invites guests’ participation and conversation. Local wines from Languedoc abound in grape varieties and blends making them very diverse and interesting. Pairing with the food is an art practiced on board Esperance. For more information and to book this barge cruise which cruises on the Canal du Midi, please contact us. The anticipation I feel when visiting barges as a barge cruise specialist is hopeful that my first impression will be the same delight my clients feel when they step on board. So when my husband, Jack, and I stepped on board Papillon, a 6 passenger deluxe barge moored in the peaceful port of Dijon, I sighed with pleasure at the immaculate deck scattered with chic and comfortable chairs bordered by planters of lush greens and flowers. The friendly welcome by Owner Bill Higgs, Captain Cedric and Hostess Barbara set the tone for our time together aboard this exquisite gem of a floating country inn. Every inch of Papillon exudes not only charm from the tasteful fabrics and décor but quality in design and timeless woodwork. From the spacious deck, a few stairs down lead to the airy salon with sink in sofas and inviting open bar. Fresh flowers and plants along with a library of books and music created a homey, lived in atmosphere. The traditional dining room lined with designer fabric and warm oak furniture provides an intimate space for gourmet dining. Chef Ollie was not on board, but her reputation as an excellent chef is renowned in the barging world. Hostess Barbara proudly showed us the cabins which she keeps spotlessly clean. Down a few steps from the salon, the cabins are cozy and beautifully planned for unpacking and storing luggage. The newly renovated colorful Provencal tile bathrooms with shower and wc are top quality and pleasing to the eye. The largest of the cabins has twin beds end to end with a sink and vanity separating them. It has the feel of a large cabin even though it is quite narrow. Guests who enjoy unique, comfortable accommodations in small, elegant spaces will love Papillon’s cabins. Papillon’s crew consists of the captain, chef, hostess and tour guide who take care of guests’ every need and desire. Accommodate special dietary needs? Absolutely! Stock your favorite liquors? Yes! Customize the activities around your interests? You bet! After a very satisfying visit on board Papillon and very positive feedback from recent clients, I recommend Papillon without reservation. For more information and to book this exquisite barge cruise which cruises in southern Burgundy and the Canal du Midi, please contact us. Did you ever think about the history of the canals that meander through the French countryside? Created by human labor, these channels were produced through human perseverance and ingenuity in days when traversing wilder countryside was possible only by rugged pathways or old Roman roads. A good day’s travel was measured in tens of miles, not hundreds, as it is today. The waterways we view from the decks of a Burgundy canal barge, with the eyes of a tourist or pleasure cruiser, were historically created for the critical purposes of commerce and communication. Take, for example, the Canal du Nivernais, or Nivernais Canal, in northern Burgundy. It was begun in 1784 in order to aid in the floating of lumber from the Morvan National Park to Paris. There are 110 locks and three tunnels along its 180 kilometer (110 mile) route – which makes it a fascinating waterway to traverse from a touristic perspective, but must have been extremely difficult to design and build with the limited technologies available more than two centuries ago. Over the years, the Nivernais Canal contributed significantly to the economic development of the valleys of the Yonne River through which it flows. Today, you can enjoy both the fascinating history and scenic beauty of this area from the upper deck of two barges, the Luciole or L’Art de Vivre. 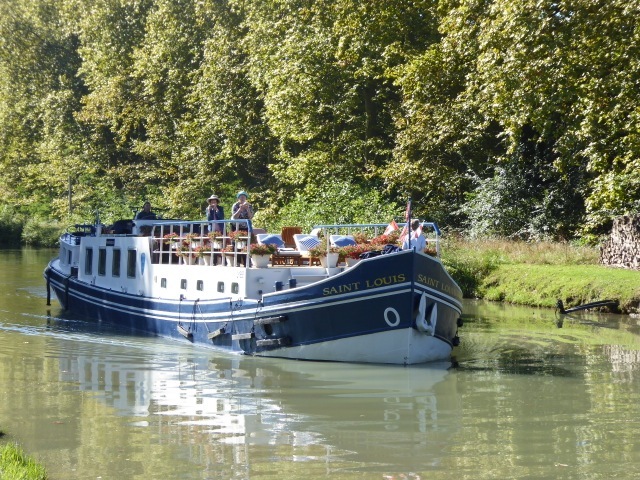 The popular 14 passenger barge Luciole has been cruising on the Nivernais Canal for over 30 years. From your vantage point on the barge or when walking and biking the towpaths, you will see curved stone bridges, vineyard vistas and bucolic pastures. Pretty villages dot the landscape inviting you to explore. The important mercantile history of the Nivernais Canal with its heritage and beauty adds to the charm of a barge cruise along this remarkable canal. Ready for an historic adventure? Contact us today to book your cruise on the Nivernais Canal. Gosh, I love my job when I receive glowing reports from clients who return from their barge cruises. Summer arrives on the Burgundy Canal near Dijon. “We returned from Paris yesterday and I wanted to send along a big “thank you” for a truly wonderful barge cruise. I’m not sure where to begin — everything was top notch. The food was fabulous — a feast for the eyes and the appetite. The wine was excellent — well-paired with the food and spectacular. The crew was so friendly, knowledgeable and accommodating. Our fellow passengers were all delightful and we truly enjoyed our time with them. Our conversations were so lively and engaging that sometimes dinner lasted for 3 – 4 hours! The scenery, the boat, the excursions, and our accommodations on the boat all exceeded our expectations. This was truly a once-in-a-lifetime experience. The only slight downside was that we were having so much fun that we did not leave the cruise as well-rested as we anticipated — but even that is good! All in all, it was a fabulous trip. Thanks again for all of your help in this. 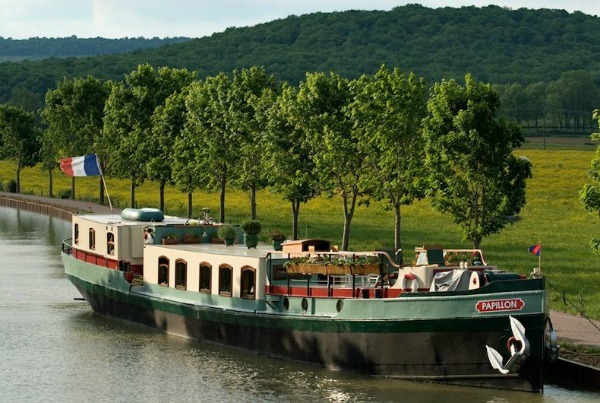 Even though I said this was a once-in-a-lifetime trip, I hope we can do another barge cruise at some point in the future.” Nancy G.
“Barging through the Burgundy valley has always been on my bucket list. Thanks to all involved, from Beth who helped us with our reservations to the barge crew for making the experience a wonderful and memorable one for me and my wife.” Ken N.
“The service was excellent. I swear they washed the windows and port holes daily. When we asked for a napkin folding demo, they jumped at the opportunity and were always accommodating to each passenger’s needs. Unbelievably beautiful French countryside and smaller towns/winery visited.” Alice N.
Dining on L’Impressionniste gets consistently good reviews for excellence in taste and presentation. Contact us today to book your cabin or charter on L’Impressionniste.